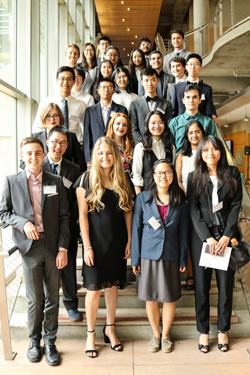 The Undergraduate Summer Research Award provides funding for UC San Diego undergraduates majoring in the physical sciences (chemistry & biochemistry, mathematics, physics) to conduct a summer research project under the guidance of a UC San Diego faculty member. The program offers students the opportunity to become immersed, full time, in a research topic for a 10-week period (July 1 - September 6). Students are awarded a $7,500 stipend in support of their time and efforts conducting a summer research project. Housing is not provided; students must secure their own summer housing. Scholarships are competitive. Women, military veterans and students from underrepresented groups are strongly encouraged to apply. Students applying for this program are required to work with a faculty member to develop and endorse a research proposal. Undergraduate Summer Research Awardees are expected to provide a written report of their accomplishments at the end of the 10-week term, as well as participate in a public poster session presenting their research. Please send application materials and inquiries to: physci-success@ucsd.edu. Undergraduate Summer Research Awards are open to all returning UC San Diego undergraduates majoring in the physical sciences, and to transfer students entering one of the physical sciences majors in fall 2019. All applicants must be in good academic standing, and they must remain in San Diego for the summer program. Students must work with their proposed faculty research advisor to develop a summer research proposal. The faculty research advisor must endorse the application and research proposal, as well as agree to store the student’s project/lab material in his/her lab for the summer. Priority will be given to current second- and third-year undergraduates. Students are awarded a $7,500 stipend in support of their time and efforts conducting a summer research project. Housing is not provided. Awards are intended to be allocated specifically during summer months for research and will not displace financial aid for the academic year unless the student is enrolled in Summer Session and receiving financial aid. Students should discuss potential impacts to their financial aid with a counselor at finaid@ucsd.edu, (858) 534-4480.